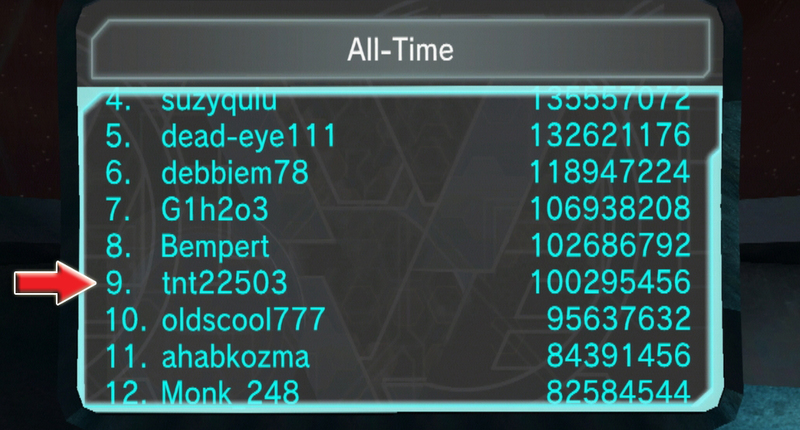 Huge congrats to tnt22503 for reaching the 100 million mark in Novus Prime and earning the coveted Alpha Squadron Mech Suit! Who will be the 10th pilot to join the elite? 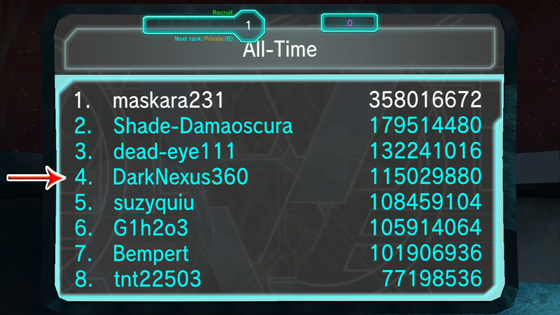 Congratulations to DarkNexus360, the most recent Novus Prime pilot to reach 100 million points on the All Time leaderboard and earn an elite Alpha Squadron Mech Suit. We salute you! Rejoice, Novus Prime fans! We’ve just released a full new line of SpeedWings in PlayStation Home, including the first-ever Novus Prime locomotion item: the Obsidian Runic SpeedWings! It’s Novus Prime‘s 2nd Anniversary weekend! We’ve enabled DOUBLE XP and FREE Spacewalk for everyone through the weekend, and join us in Novus Prime on Sunday for a Q&A and code giveaway with Novus-Cooldown at 3:00pm CST in the US, and Cooldown-UK at 7:00pm GMT in the EU region! New SpeedWings in stores now! EU fans: join us at the PlayStation Home Hallowe’en Spooktackular party in the Hallowe’en Home Square tomorrow night, 7:30-9:30pm GMT for some trivia and Novus Prime code giveaways! See the EU forums for details. 10/31/12 update: We had a great time! Check out our photo gallery on Facebook to see what we got up to. 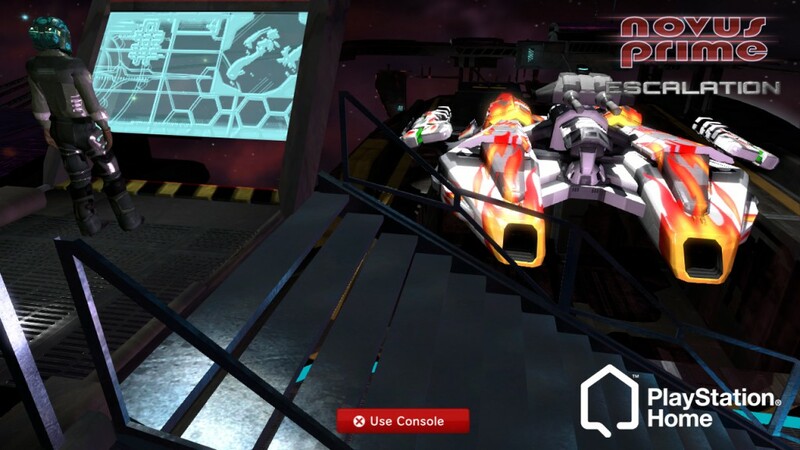 Boost your avatar’s speed up to 150% with the new SpeedWings locomotion series! Each set of SpeedWings features custom flying animations and does NOT require any clothing slots, so you can wear them with any outfit. HomeStation Magazine has the details on the Novus Prime Ship Companions, out tomorrow in the US and next week in Europe and Japan! Novus Prime Ship Companions have arrived! You asked for them, now they’re finally here: the Novus Prime Ship Companions! Available August 15 in North America, and in Europe and Japan next week. If you haven’t seen Discobot XT6000 in action yet, this episode of the HomeCast has some groovy footage at 3:33. And don’t forget to watch the newest HomeCast in the Community Theater for scenes from our Home Tycoon Q&A with AlphaZone4! 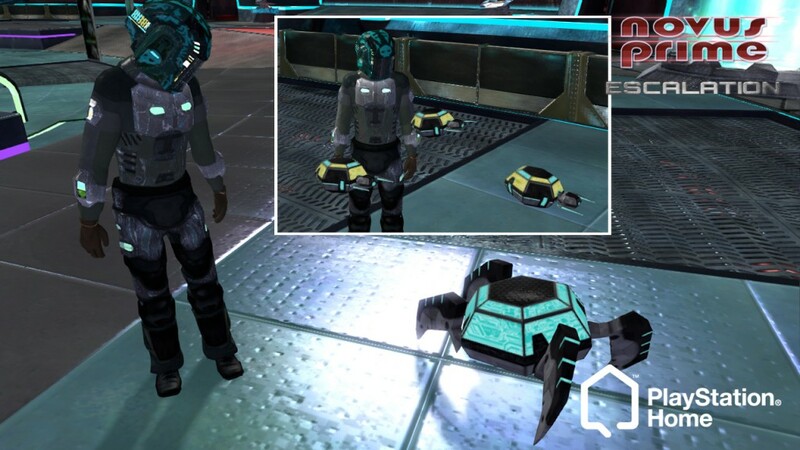 Celebrate E3 2012 with Discobot XT6000 and the Nebulon Storage Backpack in PlayStation Home’s Virtual E3 Booth this week! Alpha Squadron Arsenal now available in PS Home! It’s here! The Alpha Squadron Arsenal is now available in Novus Prime, including the Twin Pulse Cannons, Disruption Shot Pistols, Handheld Arc Drill, and Avatar Projection System. A new shipment of game-enhancing items has arrived! 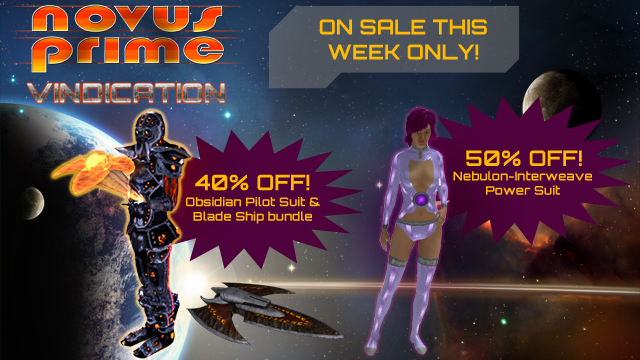 Novus Prime gets its newest shipment of game-enhancing outfits and virtual items this week! Suit up as the new Obsidian Bladewalker foot soldier with four custom animations, holographic weapon, and a permanent XP bonus in Novus Prime. Owners of the Obsidian Pilot outfit get a 20% discount! Gain the golden touch with the new gold-plated Midas Reactive Defense System and get a 25% Nebulon collection bonus when you own the entire outfit! Power up your avatar with the sleek new Ion Stream Power Armor, and show off your deadly side with the newest Obsidian technology available to the Earth Fleet: the Obsidian Throwing Star. Warp to the Novus Prime space station today to check out all the new gear and Join the Fight! Novus Prime Starter Pack now available on PSN! Gear up in Novus Prime for PlayStation®Home with everything you need to join the fight! The Novus Prime Starter Pack includes the fearsome Kunai ship with matching helmet, Radiant Storm and Ion Beam weapons with Ion Cannon male & female avatar accessories, and the universe-expanding Escalation Mission Pack. Save 50% off the standard price with this bundle for only $4.99! Tell us what you think on Facebook and Twitter, and as always, let us know what you’d like to see in the next update. Get 30-50% off select items this week in North America! Big sale this week for our US fans! Get select items 30-50% off in Novus Prime through Sunday, including both Mech suits, all three paint-job & helmet bundles, the Escalation mission pack, and more. Happy Valentine’s Day from Hellfire Games! Read the full story on our Facebook page! Novus Prime SpeedWings released + more! Novus Prime: Vindication is out now! The level cap has been raised from 20 to 30 (Commander), with new rewards at every other level! Play as the new Obsidian race with the Obsidian Pilot Suit and Obsidian Blade fighter ship bundle! 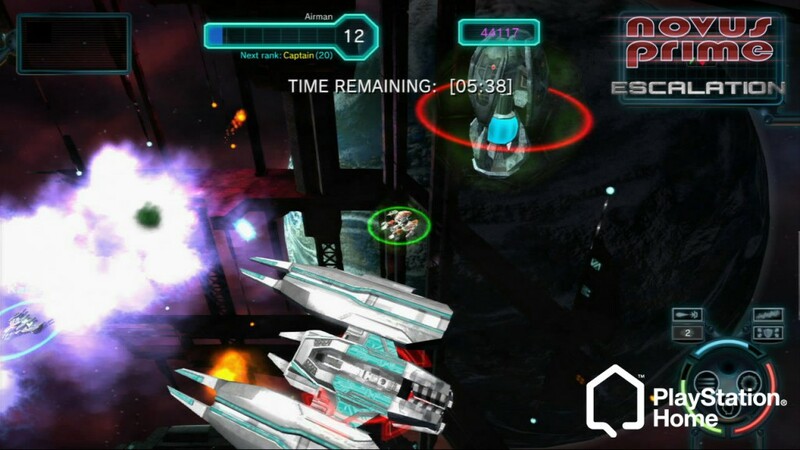 This incredibly fast ship features regenerating armor and the Razor Disc weapon, which damages all enemies in its path. The new Tech Goggles bundle comes with the Enemy Scanner ship upgrade, which causes all damage dealt to the target enemy to be doubled as long as the user remains locked-on. Rise through the ranks faster with the Long-term Memory Conditioning bundle, which boosts your earned experience points to 300%. Master versions of every mission have been added to challenge even the most seasoned Novus Prime veterans! Two new missions, “Claustrophobia” and “Wrecker’s Waltz” are now available, each with three difficulty levels. The “Mission Complete” window now shows data for all four players in the mission, so everyone can see who dealt the most damage, earned the most Nebulon, and more. 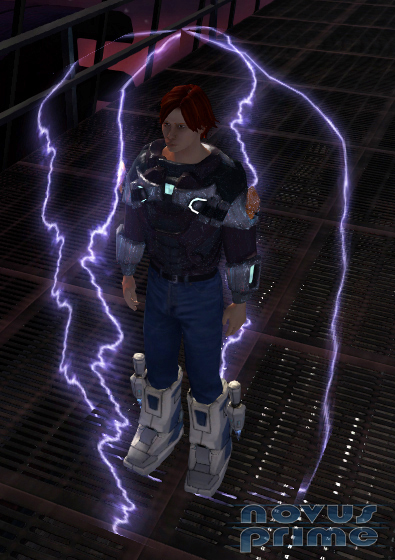 A Mech Recharger has been added to the station, which will envelope any player wearing the Power Mech Suit or the Rogue Mech Suit in crackling lighting. 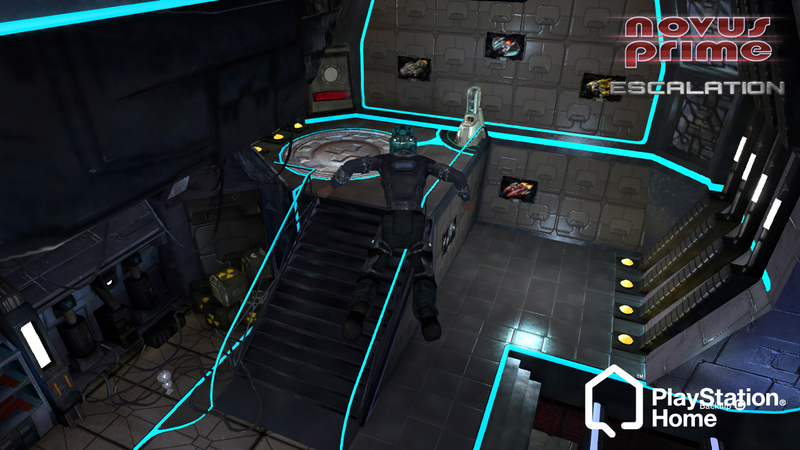 The leaderboards have been moved to the walls of the station, allowing players to see them from the central consoles. Collecting your daily salary now activates a booster for both Nebulon and experience points. Numerous bug fixes and tweaks for an overall smoother experience. 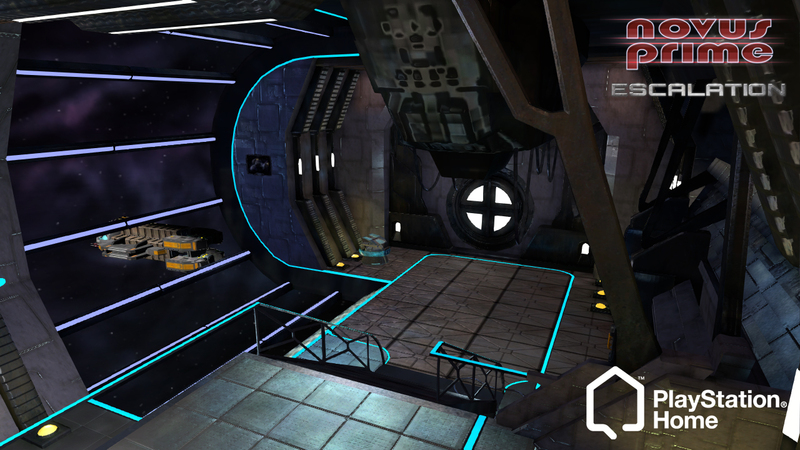 Jump into the Novus Prime space through our new landing pad in the Action District to check out all the new content! What do you think of the new expansion? Let us know on Facebook and Twitter today! The Novus Prime newsletter is out! Have you subscribed to our newsletter yet? Be sure to sign up here to get all the latest updates, promotions, and free code giveaways from Hellfire Games straight to your inbox. New subscribers will get a free Pirate Chainsword code (US region only)! 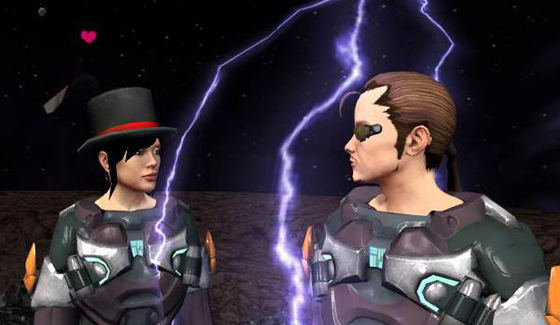 Celebrate Novus Prime’s 1-year anniversary with a free Lightning Shield item! Novus Prime just turned one year old! 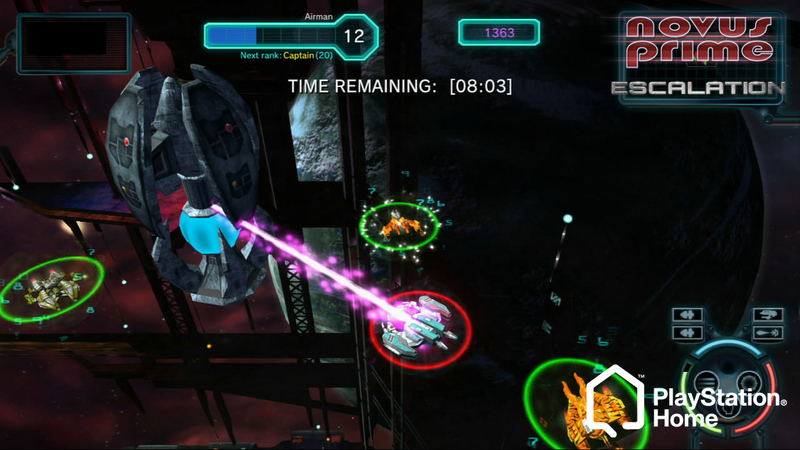 To celebrate, we’re giving out Experience & Nebulon boosters FREE in-game this week, with special items 50% off. We’re also proud to unveil our new FREE Facebook-exclusive Personal Lightning Shield item for our fans! Click here to get yours. Thanks to all of our fans for your support, and keep watching us on Facebook and Twitter for some exciting updates coming very soon. 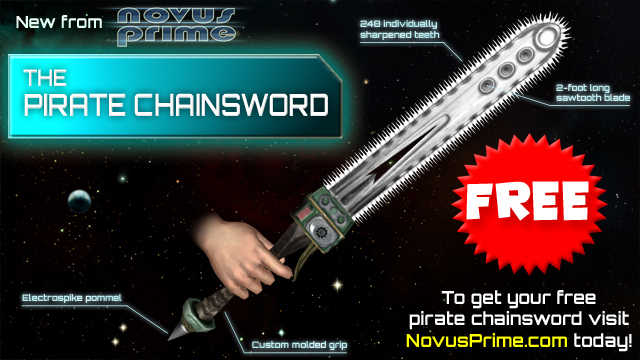 Click here for your Free Chainsword! We’re proud to announce Novus Prime: Escalation, our biggest update ever, launches in PlayStation Home on March 31 with all-new missions, enemies, weapons, companion bots, daily/weekly/monthly leaderboards, mission and tutorial voiceovers, avatar items, zero-gravity personal space, private hangar, and tons more! Novus Prime: Escalation brings a new series of missions to challenge even the most seasoned space pilots, complete with Elite versions of each. You’ll be able to acquire new weapons and items for your ship and personal avatar, purchase the brand new Officer’s Quarters personal space (with zero-gravity simulator), complete your pilot’s outfit with the Armored Pilot’s Leggings (complete with Deflection Shield ship upgrade), play private games and check out your upgraded ship up-close in the new private hangar, and much more. Check out the official Novus Prime: Escalation thread on the PlayStation Home forums to join the discussion with fans, and don’t forget to Like us on Facebook for a chance to win free stuff in our launch celebration giveaways!